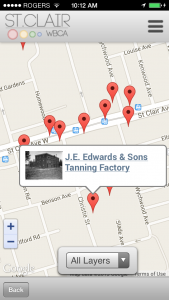 The Discover St. Clair app uses augmented reality software to present an interactive view of St. Clair Avenue and its surrounding neighbourhoods. The app lets you to experience history while viewing present day sites by displaying location-specific information, videos and historical images of buildings, events and people connected with the area. 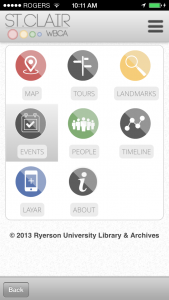 Built in collaboration with the Ryerson University Library and the Department of Architectural Science, the app can be downloaded from the Apple App Store and from Google Play. 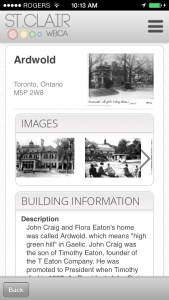 A web-based version of Discover St. Clair is also available for viewing from more traditional computing devices.